So this year I had to work the “santa shift” and the office, aka from Christmas Eve night to Christmas morning. Ugh. So in order to make the best of an irritating situation, I decided I has to bake a bunch of cookies and bring them to work. Since the Post had an article listing a bunch of somewhat uncommon Christmas cookies, I went through it and found Lemon Sables. I made a few adjustments and ta da, delicious cookies were taken to work. In a large bowl, cream together the butter and sugars. Once thoroughly mixed, add the lemon juice, zest, vanilla and egg and combine. Finally add the flour. The dough will be fairly soft, but cohesive. Refrigerate for at least 1 hour, so that it firms up a bit. Once chilled, roll the dough into a ball and slice it into rounds – when I tried this the dough was still to squishy, so I reformed them into circular-ish shapes. Bake at 350 for 15-20 minutes. These cookies were awesome and a big hit at work – my guy coworkers loved them (one said 9.9 out of 10 but I’m sure he was exaggerating). We gobbled them up quickly. You can totally taste the lemon, but its not overpowering at all and the cookie is kinda like short bread but less crumbly. All in all an excellent cookie. I think they would be perfect for a nice afternoon tea. Song of the week: Livin’ on a Prayer by Bon Jovi. It’s not Christmas-y at all, but it was a rough week for me and rocking out to this song frequently was necessary, although it hit a little too close to home at times. And it is such a great great song. Mix the egg, water, flour, and salt together to make a really smooth batter. Heat a solid amount of oil, maybe a half inch, in a frying pan. Drop a little of the batter in it, and once little bubbles form along the edge of it, it’s ready. 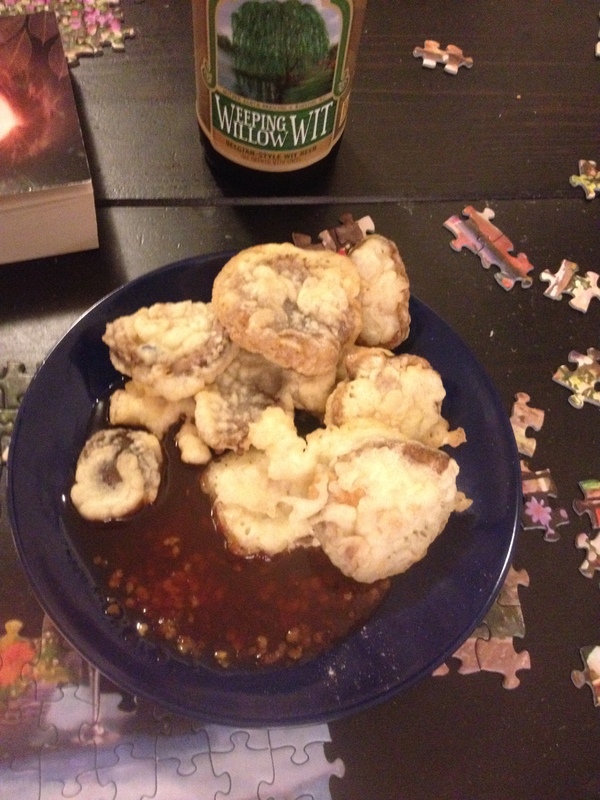 Toss the mushrooms in the batter. Make sure to coat them evenly as possible, and put them in the hot oil. Flip over once the bottom side begins to brown. Remove and place on a paper-towel lined plate. Serve hot with sweet chili sauce. The result – awesome of course! There is basically no way to screw up this recipe and almost no way to make it taste anything less than totally delicious. I served it with a beer, this time a Belgian wit-style ale, but it was a little too light, probably because it’s winter. Song of the week: Defying Gravity from Wicked. It’s been making me feel so much better about my life over the past few days. And every time I hear the line “and if I’m flying solo, at least I’m flying free” I’m all like Yes! That! So listen, and be filled with warm fuzzy feelings of inspiration and self-acceptance. I wanted to use up some of the milk in my apartment, but wasn’t sure how to go about doing it since I didn’t want pancakes/crepes/yorkies. So I called my dad and he suggested making white sauce (bechemel sauce) and doing something with that. Which was an awesome idea. Since I’d been a bit stressed lately, I decided the sauce needed to go on macaroni, and then just kinda went from there. 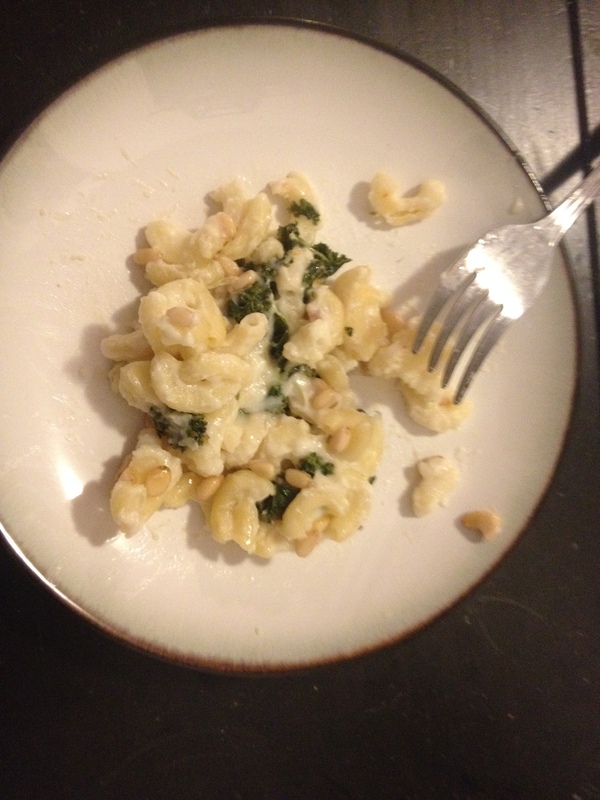 The result: Macaroni with Parmesan sauce and kale. Boil the macaroni, drain and set aside. In a medium saucepan, melt the butter. 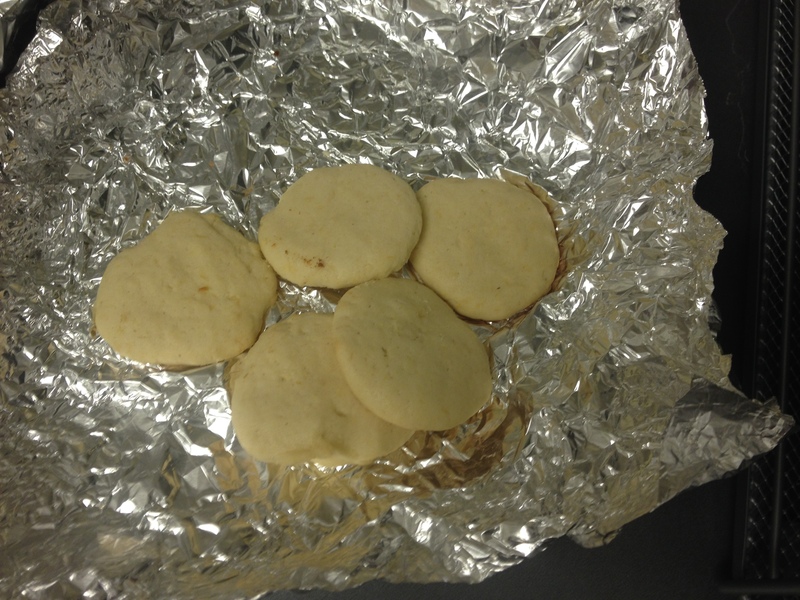 Once the butter is melted add the flour and mix them together so you have a sort of paste. Add the milk and whisk in the flour-butter paste. Then just keep stirring until the sauce has thickened, about 10-15 minutes. Once the sauce is thick, turn off the heat and add the Parmesan, stirring it in until it is entirely melted and smooth. Mix in the kale, and then the macaroni. Pour the entire mixture into a baking dish. Sprinkle the pine nuts on top and bake at 350 until its all nice and bubbly. I love mac and cheese. It is the ultimate comfort food, and endlessly versatile. There are probably a million variations you can do. Given my love of pine nuts, this one is definitely up there. Song of the week: Baby Got Back by Sir Mix-A-Lot. I love this song. It’s amazing. And I know all the words. Seriously all of them. Sure it’s a guilty pleasure, but its awesome.